It’s E’s big birthday weekend, so I decided to take the train up and help celebrate with her work friends – they are a fun bunch and it was so nice to meet all of them in person! Yesterday, while E was at work, I decided to do a little studying for my RD exam (which I just scheduled… !!!). 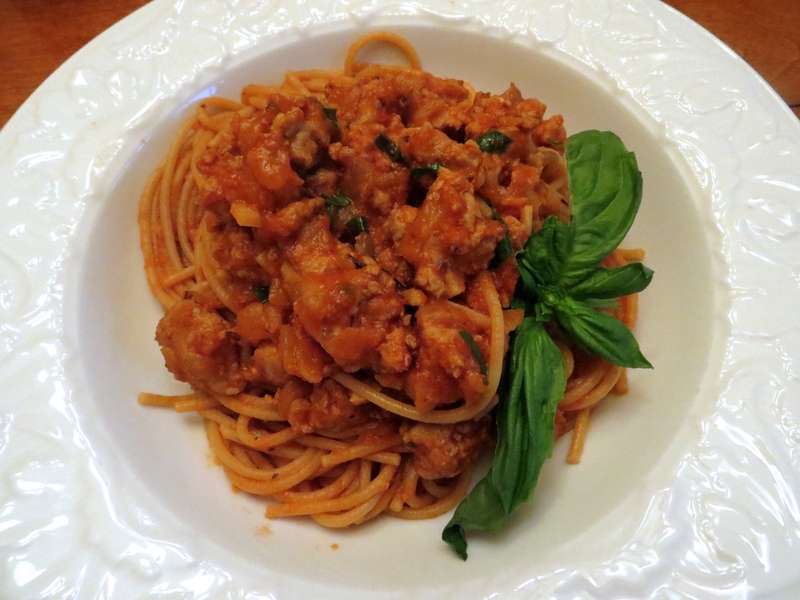 It started out great – I had my study guide, blank note cards, my TWO different colored highlighters (because I’m fancy like that), and a boatload of motivation… until 5:00PM when I decided that my mind needed a break and that I really, really wanted to share this awesome turkey bolognese recipe with you. And hooray for easy, one-pot suppers that are on the table in no time and can feed a crowd. It all starts with two medium-sized onions and five cloves of garlic. I believe that all good tomato-based sauce recipes should have a lot of garlic (and this amount isn’t too much), but if you are sensitive to garlic, you can definitely tone it down. When the onions are soft and translucent, add in one pound of lean ground turkey. Break it up with a spoon and allow it to completely brown – be patient… this can take 5-10 minutes! Note: this is a great base for many dishes… if you want, you can let this mixture cool and then freeze it. Then you have endless possibilities for dinner waiting in the freezer (like this awesome chili!). Add some crushed red pepper! I doctored up the sauce with some additional salt, pepper, and dried oregano. Let the sauce simmer as you prepare your favorite pasta! I decided to use whole wheat spaghetti, but any shape works here. When the pasta is cooked, taste the sauce a final time and adjust the seasoning to your liking. And add in a bunch of freshly chopped basil – if you add it too soon, the basil becomes brown and limp… no one likes brown, limp basil. Serve the sauce over the pasta and garnish with some grated cheese and more basil. ¾ of a jar of good marinara sauce – if you like your bolognese with more liquid, add the whole jar! 1. In a large, high-sided skillet, heat olive oil over medium heat. Add in onions and garlic and cook for 2-3 minutes until soft and translucent. 2. Add ground turkey to skillet, breaking the meat apart with a spoon. Cook the turkey until browned and cooked through, approximately 5-10 minutes. 3. When the turkey is cooked, sprinkle over the crushed red pepper flakes. Pour in the sauce and add the salt, pepper, and dried oregano. Stir thoroughly to combine. Simmer sauce over medium-low heat until the pasta is ready. 4. Bring a large pot of water to a boil. When the water is boiling, add salt and one pound dried pasta – cook according to the package instructions. When the pasta is al dente, drain pasta and set aside until sauce is finished. 5. Taste sauce and adjust seasonings, adding more salt, pepper, or hot pepper flake. Add in chopped basil and stir to combine. Option 1: Dish out pasta into bowls and ladle sauce on top. Garnish with grated cheese and more fresh basil. Option 2: Add pasta into the skillet with the sauce and toss to combine. Dish out the pasta and garnish with grated cheese and more fresh basil.